We have an extensive range of cottages with access to a shared heated pool (between 1st April and 31st September). The development at Tresooth near Falmouth also has a jacuzzi and sauna, a BBQ area, indoor games room, woodland walk, games lawn for volleyball, badminton, a children's play area with swings and a slide, and an enclosed pond with fish. These magnificence facilities make the following properties ideal for family holidays. Budock Cottage & Karensa Cottage both sleep 6 people. Porthallow Cottage sleeps 4 people. 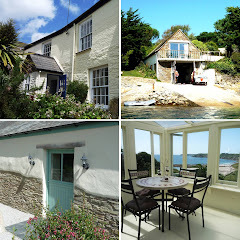 Mousehole Cottage & Helford Cottage sleep two, great for active couples. Fistral Cottage near Goonhaven sleeps 4 people with access to the shared heated pool, large gardens, enclosed picnic area with children's play area and a pond with fish. Arguably one of our best properties on the Roseland Peninsula is Tideway in St Mawes, which is a stunning property with a private 6 seater hot tub. Tideway sleeps up to 9 people, every room has a sea view, and most bedrooms are en-suite. The property has a large lawned garden and extensive deck with garden furniture and BBQ. In Crackington Haven we have two large properties with outdoor pools heated between June and end of August. They also offer a 10% discount for full week bookings on 4 or fewer people using just the two bedrooms. Samphire House sleeps up to 12 people with two lounges, and a terrace/balcony over looking the pool. Tregather Cottage has a more modern decor and a pool set slightly down the garden. Sleeping up to 9 people with a lawned area leading down to the pool with summer house. Courtyard Apartment in Fowey has a covered shared pool heated all year round. The apartment is presented in very high standards by the owner and sleeps up to 6 people. It is an exclusive holiday residence with only two other apartments on site. Greenaway Lodge, near Portscatho sleeps 6 with glimpses of the sea is set on an estate of lodges and you have access to a small heated swimming pool all year round. Only open during the day, please refer to Trewince Estate website for more details. Green Acres Cottages outside Fowey sleeps 6 with the use of a sofa bed, and have access to a superb indoor heated swimming pool with changing rooms. There is also a children's play area on site. The Beach House Apartments outside Newquay have access to the shared heated (between April and October) pool at Porth Veor Apartments where you also have access to a bar 'fine dining' restaurants and laundry facilities. The Beach House sleeps 4 people and Porth Veor up to 6 people with the use of a sofa bed.